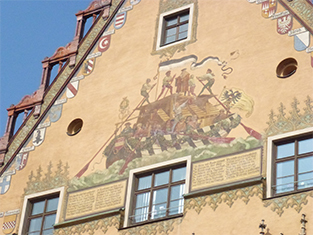 The fresco-secco paintings on the southern wall of Ulm’s town hall reflect the important role which Ulm played in the history of emigrants from German regions to the southeast of Europe. Also, the different coats of arms of other trade towns in the painting show Ulm’s function as a centre of trade. In Ulm, the streams of Iller and Blau enter the Danube. From this point onwards, the Danube was navigable from the middle ages onwards. 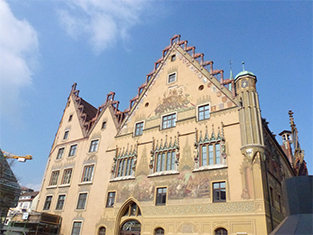 This made Ulm an important port for trade in southern Germany. Amongst others, wine, wood, leather, cheese, pigments, flintstone and seeds were transported to Hungary on the “Ulmer Schachteln” (ships, litteraly: “Ulm’s boxes”). Also, a speciality called “Ulm’s oysters” was transported from here, since Ulm was a prime location for edible snails. In the 19th century these “oysters for the poor” were transported to Vienna and sold to gourmets there. But not only products were transported on the 2.860-kilometre long river, but people as well. From the 17th century onwards, emigrants were travelling on the Danube. Most of them went in the direction of Hungary and although the journey was arduous, it was a safer and faster route than the country way. The painting on the town hall displays an Ulmer Schachtel with its characteristic black and white striped paint. In the front part of the ship the passengers were seated, the helpers and skippers stayed on the roof and navigated the ship with their long wooden rudders. The wild waters of the Danube cover the ship in spume. The Ulmer Schachtel, earlier called “Wiener Zille” (“Viennese barge”), travelled on a tight schedule and had predefined prices. The journey to Vienna took, depending on the water-level, eight to fourteen days. At that time, the ships were also called “ordinari ships”, because they travelled to Vienna “ordinary” on a regular schedule. Usually, 40 passengers would be on the ship, however, during the high tide of migration, up to 150 people were on them. These waves of migration began in 1712. In 1768, 3.000 migrants went on the “ordinari ships” within three months. 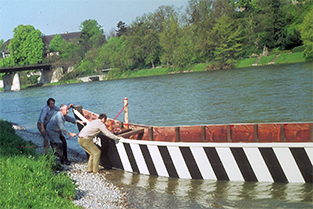 In the 19th century, the railway took the monopoly from the Ulmer Schachtel and in 1987, the last “Viennese barge” was used for commercial purposes. However, the ships were not forgotten and turned into one of Ulm’s symbols. Today, the ships are used for touristic purposes. The Danube Swabians have not forgotten the ships as well. They are displayed on many memorials in Hungary and have become a symbol for the history of migration to the Danube countries. The fresco-secco painting can be found on the southern side of the town hall. The fresco-secco painting shows an Ulmer Schachtel with travellers and crew. Ulmer Schachtel with its typical striped black and white paint.